The first court hearing was April 23 and the process stretched out until June 22. He was placed on two years’ probation and was required to surrender his driver’s license. On June 23, the first day of production for Season 2 of Alias Smith & Jones, Pete was driven to the set. It’s possible that the loss of his license symbolized a loss of control in his life. Pete was now dependent on others. A man who guarded his option to pick and disappear was now always with someone, waiting for a taxi, or stranded wherever he might be. He and Dianne Ray went ahead with their planned mid-summer move to the Hollywood Hills. The change may have detached him from old patterns and habits that encouraged drinking, but because he could not drive, its possible effect may have been isolating. Pete, however, expressed gratitude for Dianne’s influ­ence on him to make the move. “I was a basket case when I first met her,” he confessed. “I was living in a ratty apartment. Would you believe I was afraid to leave that place? I was like a child with a security crisis. Then Dianne moved me out and I saw the sun for what seemed like the first time in years. I almost threw up thinking of the life I had been leading.” Most of all, the loss of his license because of his drinking may have marked a shift in his self-image. No longer the valiant protector of the weak and challenger of abusive authority, he had become the problem, even in his own eyes. The renewal of Alias Smith & Jones for a second season meant that for at least another year, the “golden age” of varied, challenging roles was over for him. Playing “Hannibal Heyes” rarely gave him the emotional depth he enjoyed. Although the situation of a young man in constant danger of capture and life imprisonment is not comic, the series was written as such. In press interviews, Pete showed ambivalence about Alias Smith & Jones from the start. He first expressed uncertainty about how to play Heyes, but on another occa­sion described being envious of the character’s ability to remain cheerful in adversity. It is a sad irony that as Pete slid into severe depression, he daily used his acting skills to portray cheer and showy confidence. Although no longer involved in national politics, Pete was still concerned about the conditions under which actors worked. He joined the Concerned Actors Committee and campaigned for a position on the Screen Actors Guild (SAG) Board in what was the first across-the-board challenge to nominees selected by the SAG Nominating Committee. Balloting occurred the first week in November. Predictably, all the CAC candidates lost — they were perceived as a radical fringe. Pete took the news hard, perhaps as confirmation of his being a “patron of lost causes.” A week before his death, he pinned the telegram that announced his defeat to a wall and shot a bullet through it. According to his brother, Geoffrey, Pete said he did it to add a period to a sentence that lacked one. During the last half-year of his life, Pete’s physical health began to decline. While shooting the Alias Smith & Jones episode “Smiler with a Gun” in late July and early August 1971, he contracted a virus and collapsed on the set. The horseback riding required of Hannibal Heyes aggravated his old hip injury and put him in con­stant pain. He had begun drinking again, which violated the terms of his probation. Attending meetings of Alcoholics Anonymous was not effective, and he was ashamed of his inability to stay sober. The return to alcohol use also aggravated his epileptic seizures. During April 1971, amidst the court hearings, Pete played a role in the PBS production of The Scarecrow. His appearance at this time was still youthful. During Alias Smith & Jones, he became heavier than usual and then very thin. In his last months, he noticeably aged. Deep lines appeared under his eyes and on his forehead. It was not an unattractive change, but it did signal that time was passing and so was his career. A part of this alteration may have been fatigue from the pressured schedule. His days were spent working against the grain with scripts whose varying quality could be deepened by his and Ben Murphy’s talent, but rarely met his standards. Some of his final Alias Smith & Jones episodes show a worn man who is struggling to conceal that he doesn’t want to be there. “My big fear for next year is that the series will be renewed, and I’ll have to go through this for another year,” he stated. His explicit fear was realized when, two weeks prior to his death, Alias Smith & Jones received the go-ahead for a third season. Much has been written about Pete’s last day. Taken together, though, the accounts still leave questions. After a usual day’s work, his evening plans were spoiled by an order that he remain at the studio to loop lines. Harold Frizzell, his stand-in, drove him home afterward and they watched the airing of the Alias Smith & Jones episode, “Miracle at Santa Marta”; then they watched most of a basketball game together. Pete’s girl­friend, Dianne Ray, spent the evening in their bed­room. Frizzell left around 10 p.m. and later told police that Pete was sober at the time of his departure. So it is unknown when Pete began to drink, but his autopsy showed that he apparently drank rather heavily late that night. He also received a phone call from Kim Darby who was distraught and wanted to restart their relationship. Ray’s recollection of events years later goes something like this: Pete opened Christmas pre­sents and tried to get her to share the fun. Finally, he joined her in bed. After an ‘argument’ with her, he got out of bed, took his .38 revolver from a drawer, and sat on the floor to examine it. According to her, he suddenly got to his feet, walked into their bath­room, and turned to say, “See you later.” He then continued into the living room where he immediately shot himself through the head. In the very early hours of December 31, 1971, Peter Ell­strom Deuel ended his life. We will never know the exact details of that night or how the factors added up to that tragic moment. We do know he faced a number of disappointments that day alone: A cancelled evening plan, his viewing of an inadequate tele­vision episode (by his standards), the knowledge of the renewal of his series for another season, an upsetting phone call from his former lover, an unhappy relationship and argument with Dianne, the arrival of another year. Somehow, that night, it added up to more than he could bear. Another night, a different set of events, and he might have lived. But during the weeks that preceded his death, Pete had given warning that suicide was in his thoughts. The police arrived. 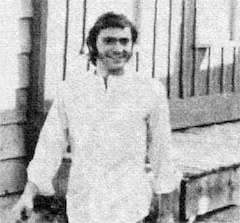 Pete’s body was removed, and the news of his suicide was spread among his friends, published in newspapers, and broadcast on television worldwide. There was a memorial service in Los Angeles at the Self-Realization Fellowship Temple and another in Penfield. His four remaining episodes of Alias Smith & Jones were aired without interruption. Pete’s final inter­views and speculative articles about his death were published. The following summer, his episodes of the series that he disliked so much were rerun and fans watched them in sorrow. And, after that, the love affair the world had with Pete Duel ended for a long time. Though some fans kept in touch through homemade newsletters, Pete’s talent disappeared from the screen, and the press rarely mentioned his name. Years passed, but people did not forget him. When video-cassette recorders were invented, fans collected and shared his performances spread throughout so many series. For the first time, it was possible to view Pete’s work in nearly its entirety. The Internet allowed these determined people to find each other and share their love and memories of Pete Duel. The emergence of this community then led to web sites and blogs, guestbooks and books. The rebroadcasting of Alias Smith & Jones in 2005 on the Encore Westerns Channel won him new fans of a generation born after his death. Thus, the collective memory of Peter Ellstrom Deuel remains fresh and strong — as does the interest in his life, his complex character, and his magni­ficent talent. Not lessened by the passage of time, the sorrow felt over his not being with us today, working and pursuing his goals as man and actor, has led people to work for the causes he held dear and to do it in his name and in his honor. Pete touched many people all around the world, and it is safe to say that his positive influence reaches far beyond those who knew him personally. His troubles were many more than was known publicly at the time of his death, and their recent revelation deepens the picture of a person who yearned to be honest with himself and ultimately judged himself by the strictest standards. He was an extraordinary man with extraordinary talent, who lived with cour­age and who wanted to make a meaningful contribution to the world. We are lucky to have had him among us.